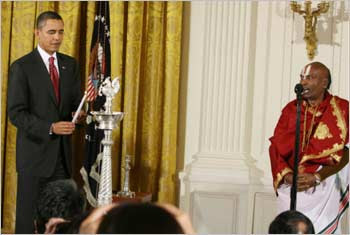 This is the first time in the history of the United States that a sitting President not only hosted a Diwali ceremony but was also present at the function.Indian government and Indian people are very happy on this Diwali as the American president Barack Obama himself celebrated the Indian lights festival. "This coming Saturday, Hindus, Jains, Sikhs and some Buddhists, here in America and around the world, will celebrate this holiday by lighting diyas, or lamps, which symbolise the victory of light over darkness, and knowledge over ignorance," said Obama at a ceremony in the East Room. Obama said at his ceremonial speech in white house. It was previous president George .W Bush who actually started that tradition but he never took part himself but now Obama has taken a step ahead of litting the lamp and of taking part in ceremony by himself. Obama went to Indian treaty room and lit lamp with a candle then he listen the speech of “pandit” who was reciting from the sacred book Upanishads. Obama also had a “tilak” on his head. Obama then lit the traditional lamp with a candle as a Hindu priest with a three-forked tilak on his forehead chanted "Asatoma Sadgamaya" (Lead us from the unreal to the real, from darkness to light, from death to liberation) from the Upanishads. Obama listened intently as the priest ended his invocation with "Om Shanti Shanti", returned the priest's namaste with folded hands and then shook his hands before leaving with greetings of "Happy Diwali and Saal Mubarak" to everyone. "Thank you Mr President for being the first president to come to the Diwali ceremony," a journalist called out to Obama. "Yeah, isn't that something?" the president shot back. Obama's White House also did not forget to leave the traditional box of Indian sweets on some 150 chairs for the guests. 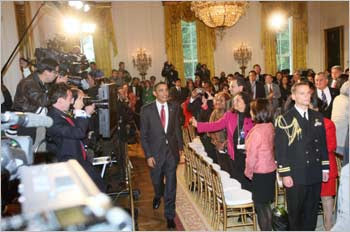 The half-hour East Room celebration was attended by a crowd of Indians and other Asians. India's Commerce Minister Anand Sharma and Ambassador Meera Shankar dropped by, and several Indian-Americans in administrative positions in Washington attended. The brief ceremony began with a performance by the well-regarded Hindi a-capella group Penn Masala. The White House kept it light and simple. A box of Indian mithai (sweets) was placed on some 150 chairs that filled the East Room but there was no food fest or song and dance. After his remarks, much of which was devoted to the Asian-American initiative, there was a single lamp that Obama lit from a candle. The Siva-Vishnu temple priest, dressed in ceremonial togs with an enormous three-forked tilak on his forehead, kept his invocation short -- chanting ''Asatoma Sadgamaya'' (Lead us from the unreal to the real, from darkness to light, from death to liberation) from the Upanishads. Obama, having lit the White House diya (a word he handled with aplomb) and wished everyone a ''Happy Diwali and Saal Mubarak,'' listened intently as the priest ended with ''Om Shanti Shanti.'' He returned the priest’s Namaste and then shook his hands before striding out to attend to the business of war. ''Thank you Mr President for being the first president to come to the Diwali ceremony,'' a gadabout journalist called out to Obama. ''Yes, how about that,’’ the President shot back. Also, the event was always held in the Indian Treaty Room at the Old Executive Office Building, which is adjacent to the White House, and serves as an administrative office of the White House. Indian Ambassador Meera Shankar and visiting Commerce Minister Anand Sharma were special guests of the White House at the event. Degos Disease...Extremely Rare Vasculopathy !! Mysterious Death Of Mike Zimmer's Wife Vikki..!! When Even Politicians Bag A Nobel !! 12 Most Weird Cakes You Can't Bear To Eat ! !